1 of 5 Heat oven to 350 degrees F. Line a 9 x 9 x 2-inch baking pan with nonstick foil, overhanging short ends. 2 of 5 Whisk together flour, cocoa powder, baking powder and salt; set aside. 3 of 5 In a large microwave-safe bowl, combine 4 ounces of the chocolate and the butter. Microwave for 1 minute. Stir and microwave for 30 seconds more. Stir until smooth. 4 of 5 Stir sugar into chocolate mixture, then stir in eggs until well blended. Stir in flour mixture and chopped pecans until just blended. Pour into prepared pan and bake at 350 degrees F for 30 minutes or until toothpick inserted in center comes out clean. Cool 15 minutes. Use foil to lift brownie from pan; cool completely on a wire rack. 5 of 5 Combine remaining 4 ounces chocolate, oil and sugar in a small bowl and microwave for 45 seconds or until melted; let cool 5 minutes, then spread onto brownie. Allow to set for at least 2 hours. 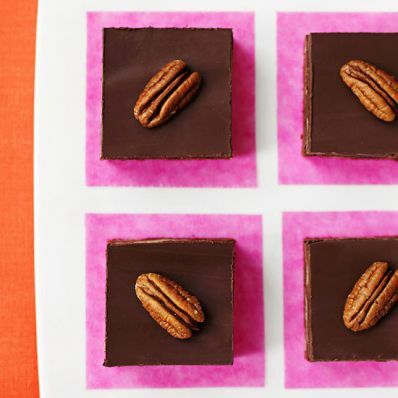 Cut into squares; top with pecan halves. Per Serving: 95 mg sodium, 2 g fiber, 280 kcal cal., 7 g sat. fat, 41 mg chol., 19 g Fat, total, 31 g carb., 4 g pro.